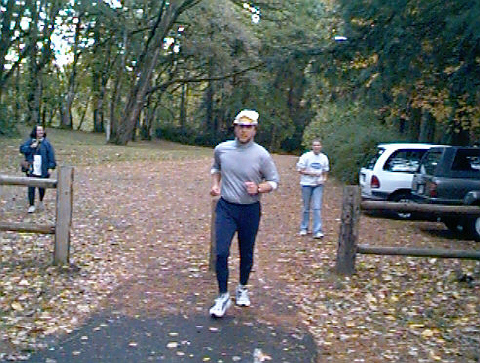 A number of years ago I was a runner. I ran for fun, I ran with friends, I ran to be in the forest, I ran for stress release—I just ran a lot. I wasn’t very good mind you, but I ran. The more I ran, the more I wanted to see what more I could do—to push myself. This had two effects on me. I found out I was able to finish what I started—even if it was a very hard and long task. My longest run was a 100 mile race. I didn’t “race it”—I wasn’t competitive, but I wanted to “legally” finish (under 30 hours). So I trained and I prepared and on the day(s) of that race I found there was one thing I needed to do—keep running. As long as I didn’t stop, I was still in the race. No matter how much I hurt (I tore the upper calf muscle at about 91 miles) I could keep going—all I had to do was not stop. Sometimes the “going” was beautiful, and sometimes it was just plain ugly—but I kept going, and when I finished in 27:22, I experienced a satisfaction I have never experienced before or after. I had the satisfaction of knowing I could do something extraordinary (just doing a 100 mile run is extraordinary for us mortals) if I kept going. God had given me the ability, and all I had to do was not waste it. That race was almost 18 years ago, but when people hear I did it I still hear the same question: “How could you run that far?” My answer never changes: “I didn’t stop”. I have found this is true for many areas of life. You are struggling in your faith? Don’t stop. Your marriage is a disappointment? Don’t stop. Your friendship is strained and ready to break? Don’t stop. You are tired of the foolishness in the world and wonder if it is worth it to try to help anyone? Don’t stop. You’ve been hurt, and you can’t get past it the way you used to? Don’t stop. You don’t know how to love a difficult person in your life? Don’t stop. Get help, seek encouragement, get nourishment—do whatever you need to do—but don’t stop. Don’t stop loving people with whom you seriously disagree. Don’t stop trying to help people just because many of them don’t want or accept that help. Don’t stop being who God wants you to be even though everyone around you wants you to be like them. Don’t stop living just because life is hard. There was another effect running this race had on me: years later, it saved my life. As I trained for this race (for years as it turns out), and as I ran the race, I experienced fatigue, frustration, pain and more. But those things were actually building my body in ways I didn’t understand. I am an asthmatic, but my lung capacity and strength improved so much that 15 years later it was still far above average—and it literally saved my life. I was diagnosed with a rare bone marrow cancer, the only real treatment for which was HSCT (Hematologic Stem Cell Transplant). This is an extremely dangerous process where the patient basically takes such a high dose of poison it destroys all bone marrow, and therefore blood. The idea is that, with an infusion of new stem cells, it restarts the patient’s blood production without the cancer. After taking it, the patient is usually hospitalized for about a month—basically just trying to keep him alive. During this month I almost died for several reasons, one of which was fungal pneumonia. The doctors tell me that if I had normal lung capacity and heart strength, I would never have walked out of the hospital. But I did walk out because years ago, I didn’t stop. Today, many of you who are reading this are probably struggling–and some of those struggles are monumental. I can’t tell you everything will go away—my issues haven’t. But I can tell you this: as you walk through these issues with the Lord and allow him to strengthen you through them, the one thing that is absolutely necessary is this: Don’t stop. Mary, I have noticed the same thing:-). There are things that focus us and strip away the denial in our lives–even if we weren’t aware it was there. We are praying for you as you continue to fight. Thank you, prayer is coveted and appreciated! Thank you Randy. I can not tell you how I needed this encouragement today! Debbie, I am always surprised and humbled when something I write is timely and useful to someone I haven’t even talked with for some time. Thanks for the encouragement.